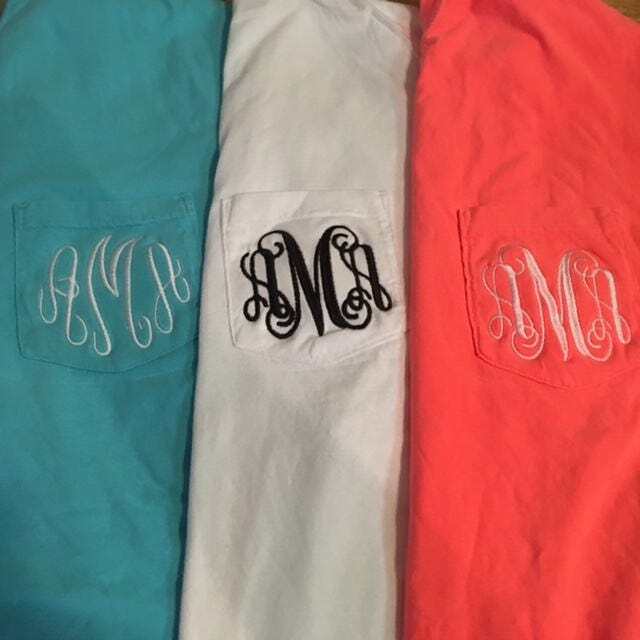 Enter monogram (first initial, last initial, middle initial), thread color and font choice. Back to School special for Shirt Sleeve Monogrammed pocket Comfort Color t-shirt. Theses are unisex so please take that into account when ordering. Pocket will be stitched closed. The only colors available are the ones in the drop down menu. Please do not choose one color and list another color in the notes. The colors chosen in the drop down menu will be the ones sent. All sales are final due to the customization. Love my shirts! I ordered a size up just in case, but they run very true to size, if not a tad bit big. So soft, comfy and cute! Love my monogram tee! Shipping time was exactly as stated or a few days sooner! Sew Cute 4 You strives to provide you with the best quality monogramming, embroidery and screen printing for all your custom needs. All work is done in our store and by us. Because of the custom nature of our products, we cannot accept returns. Personalized items are non-refundable. Please make your color/fabric selections carefully as once items have been monogrammed or personalized, they are non-returnable. Kindly make certain to provide full names in the order of First, Middle, Last full name where requested. We cannot be responsible for monograms that are placed out of correct order if the full name is not given as requested when ordering. If the full name is not provided in the personalization info box and only initials are given they will be entered exactly as given so please make certain to enter them in the order that they should appear (FIRST, LAST, MIDDLE) for initials ONLY - not full names. If names are given incorrectly as First, Last, Middle your order could arrive incorrectly. Embroidered names (name only) will appear exactly as typed. All pricing listed is in US Dollars. Our items are custom in nature and we want you to be pleased with your purchase. Computer monitors can display colors differently so please be aware of this when placing your order. We cannot accept returns on customized items because the color did not appear on the website as in person. Monograms can vary by letter from font to font. Please note that we cannot accept returns on our products because a customer is not pleased with a letter or monogram choice. Please note that once an order is placed, it cannot be changed or canceled due to the custom nature of our products. In the event that an item is not monogrammed and needs to be returned, the amount of the item will be credited back in store credit only. Insurance is provided with Priority shipping only for U.S. shipping. If you order one item no insurance will be included. If you wish insurance it can be included for a small fee. Please contact us if this is something you wish added to your order.